If you’re an electrician, you’re likely surrounded by danger every time you clock in. The work environment is often riddled with hazards that you need to be wary of. Whether it’s live wires, open circuitry, or slippery floors, the key to staying safe is to invest in top-notch gear. Your work boots are one of the most important components of your uniform. They can keep you protected from work accidents while providing you with the comfort you need to stay on your feet. While the market is flooded with standard work boots, electricians need special boots that have unique safeguards built right in. Boots should be flexible enough to hold up in a variety of different work environments and durable enough to withstand constant wear and tear. They should also have the appropriate safety rating to fit your particular work environment. To help you on your search, here’s a list of some of the best work boots for electricians that money can buy. These boots from Timberland have a number of great protective features. Not only does the rubber sole have electrical hazard protection but it’s also resistant to oil spills, slips, and abrasion. The bottom arch also has added traction to help you climb ladders with ease. A built-in toe cap and puncture plate are also built right in for additional protection. 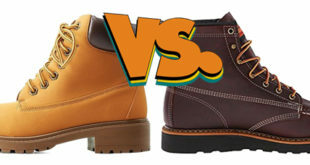 When it comes to comfort, Timberland has gone above an beyond to minimize fatigue. The soles absorb shock and return energy back to the foot so that you can move without issues. There’s also a fiberglass shank for support. 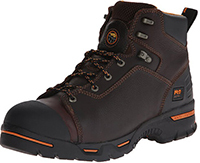 With absolutely no metal in these boots, they’re perfect for any busy electrician. The boots are made from leather and have a thick rubber sole that’s attached with strong cement. The black uppers are accented with a reflective strip on the midsole to make sure that you’re seen at night. Inside the boots, you’ll find a removable cushioned insole for comfort. There’s also a mesh lining to wick away moisture. The outsoles are built with safety in mind. It’s designed to be slip resistant. It can also keep your foot safe from chemicals and abrasive damage. This offering from Dr. Martens has a unique look and fierce protection from a variety of different hazards. The uppers are made from a synthetic material that’s molded with a ballistic mesh pattern. There’s also a composite toe cap built in. Plenty of comfort features are also included inside. The lining is breathable and has an antimicrobial treatment applied. The footbed is made of molded smart foam. 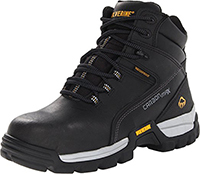 The rubber compound outsoles are slip-resistant and have electrical hazard protection. They also offer high traction. To top things off, the outsoles are heat resistant to 572 degrees Fahrenheit. Don’t let the traditional design of these boots fool you. The thick rubber soles are meticulously designed to move with your foot. It utilized Rugged Flex technology to stretch and compress as you work. They’re attached to the leather uppers with cement for added comfort and flexibility. The treads on the bottom are also resistant to slips and oil. A composite toe helps to prevent injuries while the electrical hazard protection has you covered if you encounter live wires. Heavy padding on the tongue, collar, and insoles cushion the blow of every step while the EVA midsole provides some much-needed arch support. 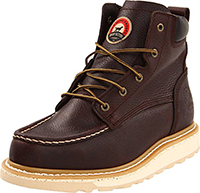 The work boots from Irish Setter are made from high-quality materials throughout. The uppers utilize full-grain leather that’s been treated to keep water out. Goodyear Welt construction is the construction method of choice to ensure that the thick rubber soles stay put through years of abuse. The bottom of the soles features a simple tread that improves traction. 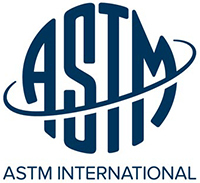 They meet ASTM standards for electrical hazard protection. If you’re surrounded by heat, you’ll be happy to know that the soles are also capable of withstanding temperatures up to 475 degrees Fahrenheit. 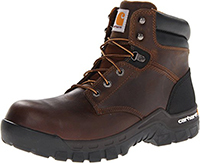 These boots from Timberland work well to keep you safe on and off the work site. Full-grain leather covers the uppers. 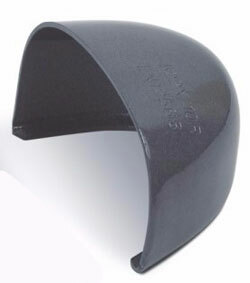 The material rises approximately 6 inches from the arch and is resistant to abrasive damage. Double rubber toe caps have your toes covered while thick Vibram soles keep the bottom of your feet protected. The platform heel is roughly 0.75 inches high and incorporates sturdy pegs for added traction in any environment. The combination of Vibram and rubber helps to provide electrical hazard protection. Inside, you’ll find an antimicrobial mesh lining and a fiberglass shank. 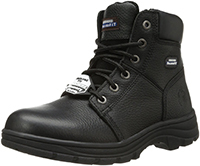 With its classic and rugged design, these work boots from Skechers will fight right in at a construction site. The boots are clad in leather uppers that are available in three distinct colors. The uppers cover the arches and have a full lace enclosure to help you get that perfect fit. The rubber soles provide electrical hazard protection and are designed to be oil-resistant. To keep your feet comfortable, the manufacturers utilized a fabric lining and a removable insole made from memory foam. The midsole also helps to provide support as you work by absorbing shock. Electrical hazard work boots are specifically designed to combat your biggest hazard: electric shock. Electrical hazard protection is a requirement on many job sites. 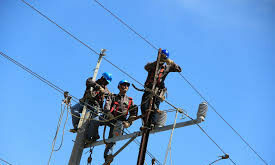 To comply with OSHA standards, the boots need to be able to withstand 18,000 volts for at least a minute without transferring the shock to your body. While you should by no means purposefully walk on live wires, the boots will have you covered if you do so by mistake. Manufacturers will often label their products with a stamp of approval from the ASTM to make finding the right pair of boots a cinch. But what exactly makes the boots safe for electrical work? 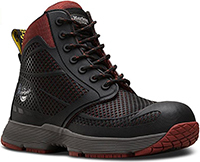 These boots have a thick rubber sole that helps to keep your body insulated from electricity. Essentially, they allow you to stay grounded. 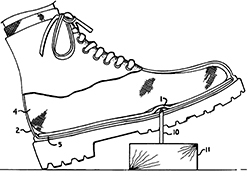 If your foot makes contact with a live wire, the rubber will stop the current in its tracks. 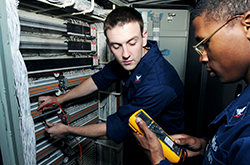 There are a couple different types of electrical hazard classifications to choose from. It’s important to plan for your worksite and choose an option that’ll keep you the most protected. 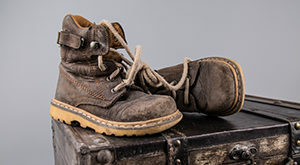 These are the most common types of boots made for electricians. The thick rubber soles provide ample protection against shocks. They’re designed to save you from potentially dangerous injuries by insulating your foot from a high voltage current. They’re often labeled as EH boots. Static dissipating models are designed to let the current flow. While this may seem counterintuitive, it can be incredibly helpful when you’re working in an environment that’s sensitive to static electricity. For example, if you’re working in an area where flammable liquids and fumes are present, you need to prevent a buildup of static electricity at all costs. The boots let static electricity dissipate through the inner lining, into the sole, and down to the ground. It should be noted that these boots don’t provide any type of protection during exposure to high voltages. Once you’ve determined what type of protection you’ll need for your work environment, you can narrow down your options by taking the following features into consideration. Your boots need to do much more than just protect you from shock. They’ll be worn day in and day out, so why not go all out and get boots that have all the bases covered? The overall construction method used to put the various shoe components together can have an effect on your investment’s longevity and comfort. Manufacturers can use a variety of different techniques to lower cost, improve durability, and increase comfort. If you’re looking for a pair of boots that will last for many years to come, consider options that utilize the Goodyear Welt method. 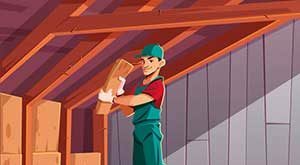 This construction method is often praised as one of the best. With this method, a leather strip is attached to the uppers and insoles. The soles are then sewn in through the leather strip, also called a welt. This results in a tight and strong bond. Best of all, the soles can be reattached and repaired if they experience damage. If you’re constantly on the go and need ultimate flexibility in your foot, you may fair well with a boot that uses the direct-attach method. With this technique, the premade uppers are attached to a mold. Molten rubber is then pumped into the mold and left to harden. This creates a thick rubber sole that’s attached directly to the uppers. Soles can also be bonded with cement. 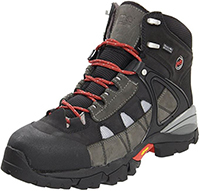 These boots tend to be lighter, more comfortable, and easier to break in. However, they typically have the shortest life and can’t be resoled or repaired. Take a look at the bottom of the boots to ensure that they can keep you safe and upright no matter where the job takes you. It’s not uncommon to see oil spills or wet surfaces on the work site. Thick rubber soles made from rubber or Vibram can keep you stable. Look for a slip-resistant label and pay attention to the tread design to see how it’ll perform in precarious environments. 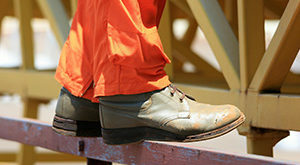 If you need to climb up ladders, look for boots that have a heel that’s at least 0.75-inches high. There should also be a bevel of at least 45 degrees. These features can help to improve your grip on ladder rungs. Many employers require you to have boots that are capable of withstanding punctures. Construction sites are often riddled with broken glass, stray nails, and a bevy of sharp objects. Many boots incorporate thin metal or composite plates. The plate is sandwiched between the layers of the rubber sole to stop punctures from making their way through. Durable caps can be used to keep your toes protected from falling objects, crushing injuries, and much more. Manufacturers utilize caps made from steel or composite material. While many electricians opt to avoid metal toe caps for obvious reasons, they’re not necessarily hazardous. Most manufacturers place the caps between two layers of rubber so that the material isn’t touching the toes or the outside of the boot. If that’s the case, the boots are safe for electricians. Overall, it’s important to take time and consideration when choosing a pair of work boots. 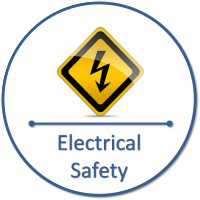 Electrical shock can lead to lasting injuries and even death. Pick up one of these pairs to ensure that you can work confidently and with no issues.